I watched the US version of The Office until Steve Carell left. The last episode I watched, prior to last week's finale, was "Goodbye, Michael" in season seven. I did something similar with ER. I followed and enjoyed ER until Dr. Mark Greene died. That was it for me. I felt no need to continue watching, although I did return for the seres finale. The Office finale, which I just watched yesterday, was very well done. It was sweet, funny and sad with just the right amount of nostalgia and closure. The return of Michael Scott was the icing on the cake. Did you see The Office finale? What did you think? I watched every single episode... but feel the show sort of lost its direction after Carell left. I still thought it was enjoyable and funny, but the plot was all over the place. The finale was great. Yeah, I've seen people online nitpick it to death, but for someone that can't take TV that seriously, it seemed about as perfect as it could be. Funny, lots of callbacks, classic awkwardness (holy hell I was dying at the scene with Meredith's son), and great closure. The Pam & Jim stuff had been pretty crappy in the last season, but it was resolved as well as it could have been. I thought it was interesting that Dwight developed into the most decent, stand-up character of the lot. I can't think of a better finale. I've seen people say shows like MASH, Six Feet Under, Spartacus, Shield & Prisoner & Weeds all ended well ... but I haven't watched them. I still remember Seinfeld, and felt pretty burned by Lost. I thought as they ramped up to get to the homestretch this season they managed to capture some of the old magic. AARM might have been the best episode since Carrell left. I liked the finale. It hit a lot of nice notes. The fact that Michael had two phones for all his pictures was both sweet and insane at the same time and summed up the whole character perfectly. It won't stand the test of time as a great episode, there was just too much to do to wrap up 9 years. 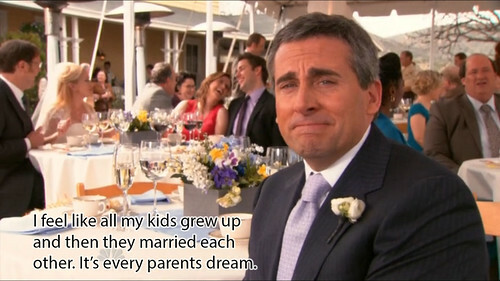 And Goodbye Michael Scott will always be considered the true finale. Carell WAS The Office (or at least why it was so hilarious). When he left, the show died a slow, painful death - certainly for people who watched the final 2 seasons sans Carell. I am in the minority here but I never found Carell funny in the Office. The character made me cringe more than laugh. Creed on the other hand. What a great man. I never really watched The Ofiice. So, I have no opinion one way or the other. But I'll say this for finales, they rarely live up to expectations. I was a huge Weeds fan, but I hated the ending. Seinfeld is one that I disliked at the time, but Ive grown to appreciate it. Of all the shows I watched with any regularity, I liked Cheers' finale best. There's a future post for you Mike - What was the best TV finale(s) of all-time? My favourite finale of all-time is Six Feet Under. I also quite liked The Wire ending, but it wasn't as good as Six Feet Under. I grew to appreciate the Sopranos ending... now I love it. But at the time I didn't dig it at all. I still feel a little cheated by the Lost ending. I have never watched 6 feet under, or The Wire, or Sopranos, or Lost. My ability to participate in this conversation is now 0%. You're missing out with The Wire, Sopranos and Six Feet Under, perhaps my three favourite shows of all-time. For me The office has kind of last it's track in the last few season. The Jim and Pam drama was a bit much and was never too into those characters as I was with the interaction of everybody else.